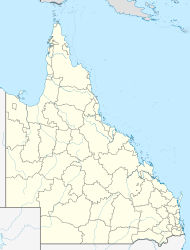 Brooweena is a small town and rural locality in Fraser Coast Region of Queensland, Australia. In the 2011 census, Brooweena had a population of 263 people. The town is located in the Wide Bay–Burnett area and is 266 kilometres (165 mi) north of the state capital, Brisbane. It is on the Maryborough-Biggenden Road. The north-west of the locality includes a large portion of the Wongi National Park and the Wongi State Forest. The town was established following the arrival of the Mungar Junction to Monto Branch Railway in 1889. Brooweena Post Office opened on 23 December 1889. Brooweena Provisional School opened on 21 March 1904; the first teacher was Eugenie Eveline Hay. It was upgraded to a State School in 1909. In 1915, the chambers of the newly established Shire of Woocoo were constructed in the town. This small building survives to this day as part of the Early Settlers Museum operated by the Woocoo Historical Society. In 1922 the residents of the Woocoo Shire erected a war memorial outside St Mary's Church of England on the Maryborough-Biggenden Road at Teebar (now within Boompa). In 1992 the memorial was relocated to the Woocoo Historical Museum in Brooweena due to concerns about vandalism. It is now known as the Brooweena War Memorial. A timber mill was established in 1924, ensuring the continuing existence of the town. New council chambers were opened in Brooweena on 14 April 1962 by Jack Pizzey, the Member of the Queensland Legislative Assembly for Isis. The town set an unofficial record in 2009 when 134 people simultaneously played the lagerphone. Brooweena State School is a government primary (P-7) school located in Lahey Street (25°35′58″S 152°15′41″E﻿ / ﻿25.59932°S 152.261265°E﻿ / -25.59932; 152.261265﻿ (Brooweena State School)). In 2012, the school had an enrolment of 20 students with 2 teachers (1.5 full-time equivalent). There is no secondary school in Brooweena; the nearest are in Maryborough to the east or Gayndah to the west. ^ a b Australian Bureau of Statistics (31 October 2012). "Brooweena (SSC)". 2011 Census QuickStats. Retrieved 2 June 2014. ^ "Brooweena (town) (entry 4702)". Queensland Place Names. Queensland Government. Retrieved 2 June 2014. ^ "Brooweena (locality) (entry 46634)". Queensland Place Names. Queensland Government. Retrieved 2 June 2014. ^ "Opening and closing dates of Queensland Schools". Queensland Government. Retrieved 2 June 2014. ^ "Agency ID66, Brooweena State School". Queensland State Archives. Retrieved 3 June 2014. ^ "Woocoo Historical Society Inc". Woocoo Historical Society. Retrieved 2 June 2014. ^ "Brooweena War Memorial (entry 600969)". Queensland Heritage Register. Queensland Heritage Council. Retrieved 3 April 2014. ^ "Brooweena War Memorial (Digger)". Queensland War Memorial Register. Retrieved 3 April 2014. ^ "Brooweena". Sydney Morning Herald. Fairfax. 8 February 2004. Retrieved 30 November 2009. ^ "Unofficial lagerphone record set in Brooweena". ABC Wide Bay. Australian Brooadcasting Corporation. 9 June 2009. Retrieved 30 November 2009. ^ "War Memorial Bridge (entry 600968)". Queensland Heritage Register. Queensland Heritage Council. Retrieved 7 July 2013. ^ "Brooweena War Memorial (entry 600969)". Queensland Heritage Register. Queensland Heritage Council. Retrieved 7 July 2013. ^ "Queensland State and Non-State Schools". Queensland Government. Retrieved 2 June 2014. ^ "2012 School Annual Report" (PDF). Brooweena State School. Retrieved 2 June 2014. Wikimedia Commons has media related to Brooweena, Queensland. This page was last edited on 29 June 2017, at 01:14 (UTC).